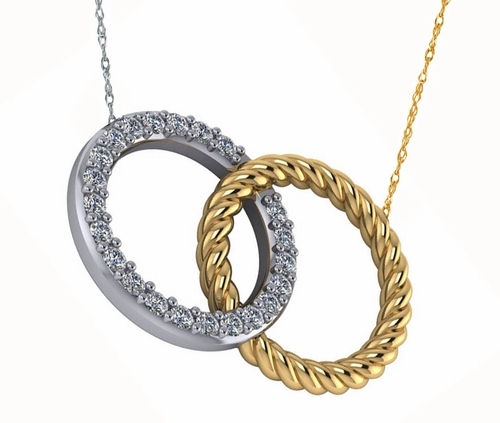 Our Twisted Rope Pave Interlocking Double Open Circle Couples Marriage Necklace wonderfully displays the common symbol for a never ending life long bond between a couple. 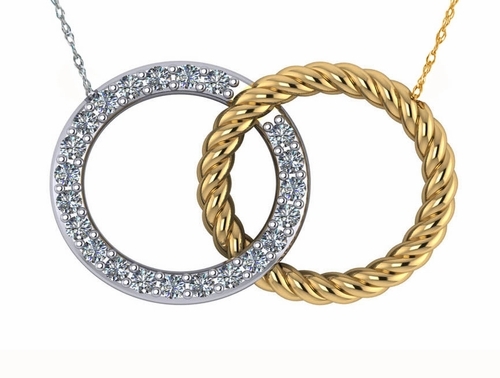 This interlocking double circle necklace is a perfect way to signify your love for one another with its beautiful intertwined design featuring one circle adorned with pave set round cubic zirconia and the other circle in a popular twisted rope design. The pendant measures approximately 25mm in length and 15mm in height with approximately .30 carats in total carat weight of the finest hand cut and hand polished original Russian formula cubic zirconia. The twisted rope style 14k gold pendant comes standard with a 16 inch fine rope chain, and an 18 inch chain length upgrade is also offered. 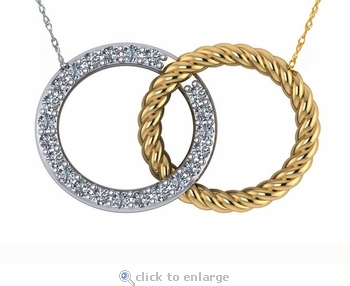 Available in 14k white gold and 14k yellow gold, please see the pull down menu for options. This necklace style is also offered in a two tone option, please see item N1117 and see item N1121 for a solid gold version. For further assistance, please contact us directly at 1-866-942-6663 or visit us via live chat and speak with a knowledgeable representative.